It’s that time again: our Behaviour Manager, Nicky Trevorrow took to Facebook to answer your cat behaviour queries. Question: I have three cats: one mother and two daughters. We introduced a new kitten about six months ago and while the mum cat and one of the girls are fine with her, the other girl can't stand her. She hisses as soon as she sees her and if the new girl, Millie, goes near her she attacks. We've tried the Feliway plugins and sprays [which copy a cat’s natural pheromone they rub in an environment in which they feel comfortable] and gradually introducing them to each other’s "territory" but nothing seems to work. Any ideas? Answer: Sorry to hear that they are not getting along. It's really important to provide lots of resources (ideally one per cat plus one extra); litter trays, food bowls etc, around the house to reduce any competition for these items. Check out our leaflet called Welcome Home and Cats living together as it may be that you need to go back to the beginning with scent swapping and keeping the cats separate. You may wish to contact a qualified behaviourist to help ease the transition. You can search for one using www.apbc.org.uk In some cases, despite people's best efforts, a cat may need to be rehomed. All the best. Question: Although our cat eats 'wet' cat food, he doesn't seem to drink water. (He likes treats and a little dry food as nibbles.) I was wondering why he isn't drinking any when he is outside? He does chew blades of grass. Is this normal, especially in the hot weather? He looks fine. 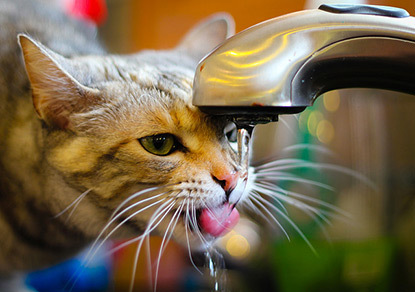 cats need to be able to access their water without having to pass objects that they perceive to be frightening, such as other cats, so ensure the water bowl is sited in a location acceptable to the cat. Cats often chew grass to make themselves regurgitate to bring up fur balls. You can speak to your vet about grooming advice and appropriate brushes, as well as diet as some can help with fur balls. Question: I have an 18-month-old cat. Since she came to us she 'suckles' on a fur throw I have on my bed. Is this a comfort thing for her or is it to do with mimicking being fed by her mum? She still does it now! Answer: Suckling to gain milk from the mum, often accompanied with kneading, is a left-over kitten behaviour. Normally this behaviour fades away as they grow up. 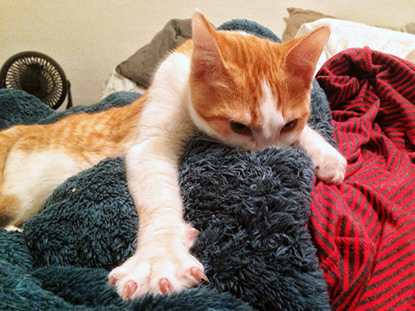 Most cats just tend to do the kneading (sometimes called padding) when they are content and happy. The main thing to look out for with suckling is that they don't ingest any of the blanket. Wool eating is more commonly seen in Siamese cats and Orientals but can happen in moggies too. If so, contact your vet and tell them that the cat has eaten material as it could cause a foreign body and/or blockage. If the cat is just licking or suckling on it, and it not harming them then it's ok to let them do this, but don't encourage it. Hope that helps. Question: My youngest cat (who is around eight months old) gently puts her paw on my older cat’s face (six years old) while I am making their food. She then walks in a circle and does it again. Any reason why she does this? Answer: It would be difficult to say without seeing your cats but it could be that your kitten is pushing your older cat out of the way as she wants the food. Try feeding both cats in separate locations, even if they get on well at other times. I'm sure your older cat will probably appreciate some peace and quiet! Also place food bowls away from their water bowl (as they don't like to eat and drink in the same place) and away from the wall so they can easily see the rest of the room. Please note that we are unable to give specific advice on your cat's health or any change in behaviour observed. For medical problems consult your vet who will have access to your cat’s medical history and will be able to examine them. You’ll find more information about cat care and behaviour here. Would you like to ask one of our feline experts a question about your cat? Don’t miss the next live Facebook Q&As: CP vet Vanessa Howie will be available on 16 July; Neutering Manager Jane Clements will be hosting on 30 July; and behaviour specialist Nicky Trevorrow returns on 13 August. Every live Q&A is held on our national Facebook page from 2-3pm.